His toes curled up at the tip as his feet grew (like a foundered horse) but after he got over the soreness he could run and buck like any other calf. Over the past 52 years raising cattle, my husband Lynn and I have had several "rescue" babies that started life in our kitchen. Brown Bug was one of those special-circumstance calves. He was born the night of Feb. 1, 1982, when it was 20 below zero, and too cold in the barn for a wet new baby. We temporarily stole him from his mama (a first calf heifer) and brought him in the house. Our son Michael, age 9 at the time, and daughter Andrea, 7, helped me dry him in the kitchen. Andrea named him Brown Bug. When the calf was warm and dry, we put him back with his young mama. She loved him and licked him, and he soon found the udder. We were glad she hadn't become confused, like some first-time mamas do if you interfere with that early bonding process by taking baby away for awhile. We had several new babies later that night, and not enough barn stalls for all of those pairs. To make room, we moved the cows with the driest babies out to some other sheds. Those sheds weren't as warm, but adequate shelter for a calf that was already dry. We moved Brown Bug and his mama to a little log shed. In the morning we discovered Brown Bug was sick. He had a severe kind of diarrhea that sometimes hits very young calves and is fatal unless treated. This was a new disease we'd never had on our ranch until that year — when our vet unknowingly brought it to us when he came into our barn to do a C-section surgery on a heifer. He had been on a ranch that had this disease, and inadvertently "tracked" it to several other ranches that calving season, including ours. Brown Bug got severe diarrhea and we treated him every four hours with fluid and electrolytes for two days and he got over it. We thought he was ready to out to the field with his mother, to join the other cows and calves. But as we brought him and his mother out of the log shed, we discovered that he was still a little weak, and Andrea said "Mama, he's walking funny on his hind legs." I felt the calf's hind legs and they were frozen. When he had diarrhea, he'd been dehydrated, which resulted in poor circulation to his legs, and they'd gotten too cold. The temperature wasn't cold enough to freeze a healthy calf's feet but with inadequate blood circulation Brown Bug's had frozen. So we put his mother in a pen near our house, and Lynn carried Brown Bug into our kitchen. We put each frozen hind leg in a bucket of warm water. Michael and Andrea held the calf steady so he wouldn't move around and tip over the buckets, and Lynn and I rubbed his feet. It took two hours of rubbing and lots of warm water before his hind feet started to feel warm instead of icy cold. The calf fidgeted and wiggled and by the time we had his feet thawed there were puddles all over the kitchen. We mopped it up with towels and didn't worry about the mess. We were just thankful Brown Bug had the energy to try to move around. After his feet thawed, we let him lie on dry towels by the wood stove. We kept rubbing his feet and legs, and put DMSO on them to help increase circulation. We hoped his feet hadn't been frozen too long. There was a chance that only the outsides of the legs were frozen. Unlike a horse that has one bone in the lower leg, a cow has two (side by side) with one going down to each toe. There are some blood vessels between those two bones. If we were lucky, Brown Bug's legs might not have frozen clear to the middle, and the deeper circulation might have kept his feet alive. We fed him with a bottle because he was still too weak to go out and nurse mama, and we were afraid he would refreeze his feet if we took him outside. We made a pen with chairs, to keep him in the kitchen so he couldn't wander around the house if he got up from his bed of towels. After two days in our kitchen, having a bottle of milk every six hours, he was much stronger, and we decided to take him outside to nurse his mother. We put three layers of socks on his hind legs to keep them warm, and it took all of us to hold him still and work the socks onto his feet and legs. His mama was glad to see him when Lynn carried him out to her pen, though she thought the socks smelled funny and she tried to lick his socks off while he was nursing. After that, we took him out to mama once a day and fed him bottles of milk for his other feedings. His mother looked forward to seeing us carrying him from the house every noon (midday when it was warmest); she'd put her head high and sniff the air. She became excited when she saw us coming around the corner of the house carrying baby. Brown Bug got excited, too. Sometimes he kicked and squirmed so much in happy eagerness to get to mama that he nearly kicked his socks off. He knew the routine, and became impatient when we started putting on his socks because he knew he was about to go outside to mama. One time in his wiggly excitement as Lynn was carrying him, the calf urinated, filling Lynn's coat pocket with pee. After a few days Brown Bug's feet became swollen above the hooves. They were painful as they healed, and he didn't like to walk. He spent most of his time lying on his towels. But we still needed the barrier of chairs to keep him in his part of the kitchen so he wouldn't get up and wander around when he thought it was time for dinner. Whenever I heated his bottle on the stove, he'd stand up and try to help, impatiently butting and nuzzling my legs or chewing on my clothing. He grew fast, and got too big to carry. We let him walk to mama with his socks on, helping him out the door because our kitchen floor was too slick for him to walk without sliding. After we guided him down the back steps, he could make the rest of the journey without help, following us like a dog, around to his mother's pen. When the weather finally got warmer toward the end of February, we decided he could stay outside without danger of re-freezing his delicate feet. We made a shelter in one corner of his mother's pen, with three sides and a roof — and hay to snuggle into and keep warm. We put a gate across the opening to keep him in his house so he couldn't go out and stand in the snow. We let him out three times a day to nurse. Later, when the snow was gone, we took the gate away so he could go in and out of his house as he pleased. He didn't lose his feet. There were sores for awhile, just above his hooves where skin came off, and we put medicated ointment on raw areas until they healed. 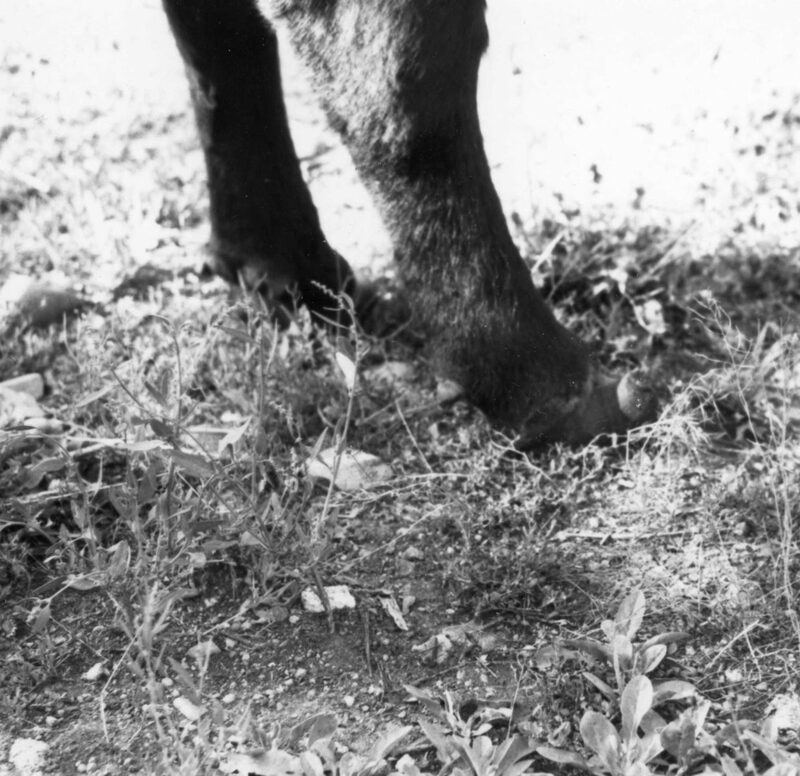 His toes curled up at the tip as his feet grew (like a foundered horse) but after he got over the soreness he could run and buck like any other calf. Since we couldn't sell him with the rest of the calves that fall because of his deformed feet, we kept him another year, and butchered him as a big yearling. We were glad we were able to save his life and his feet, and enjoyed him as one of our special characters who spent time in our kitchen. — Smith Thomas is a cattle rancher, horseman, freelance writer and book author, ranching with her husband near Salmon, Idaho. She can be reached at hsmiththomas@centurytel.net.